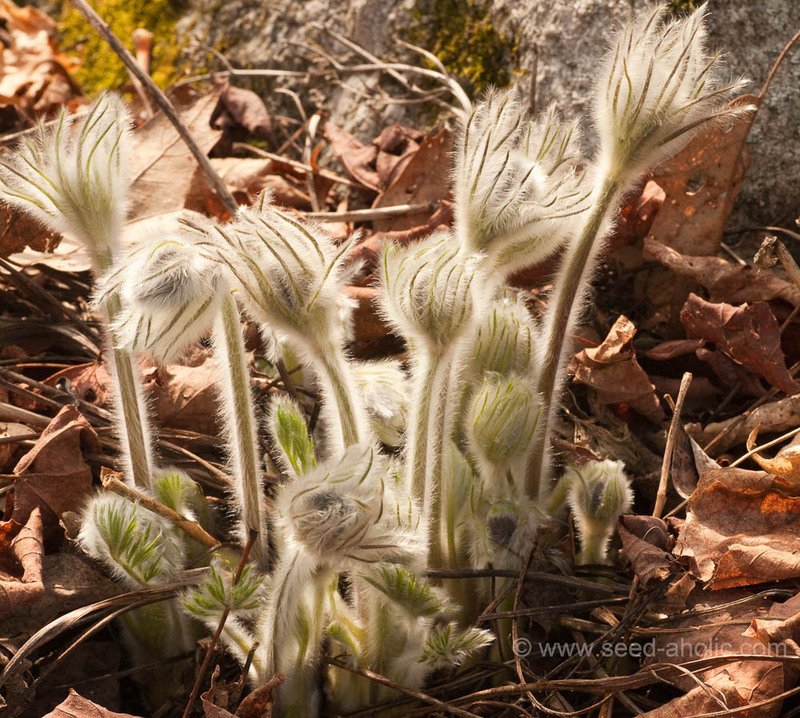 In the space of a day, scores of plants popped out of the ground and started to open. The day was the first Saturday in April. After that morning we moved on through a heat wave. Magnolia stellata plumped and opened its buds in less than 8 hours. Pervasive smells of honey wafted from Aethionema oppositifolia, one of the earliest harbingers of my spring garden. 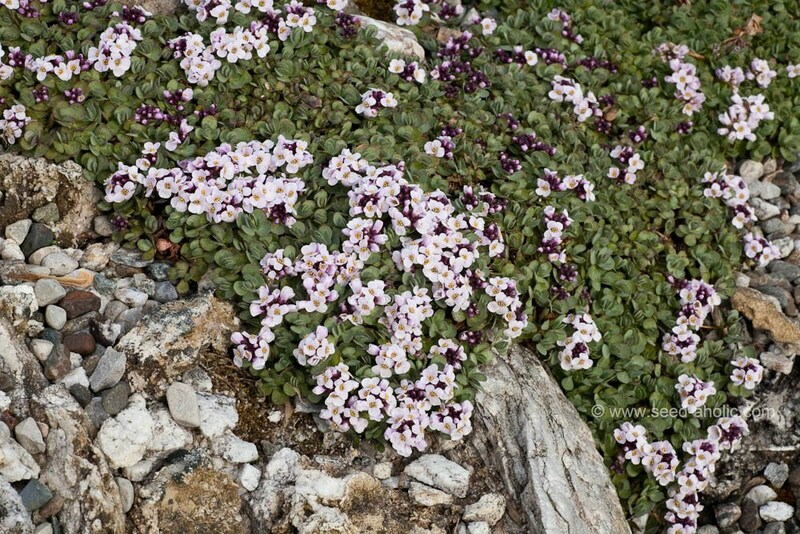 (What a great easy plant! 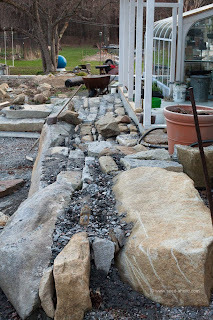 Just give it scree, sun and drainage. It spreads without overcoming its neighbors.) 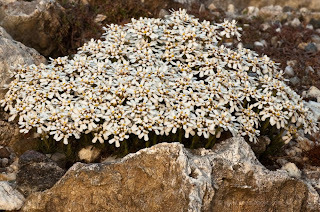 It blooms with the crocus and flowers for over a month, partnering the first and last of the Kabschia saxes. 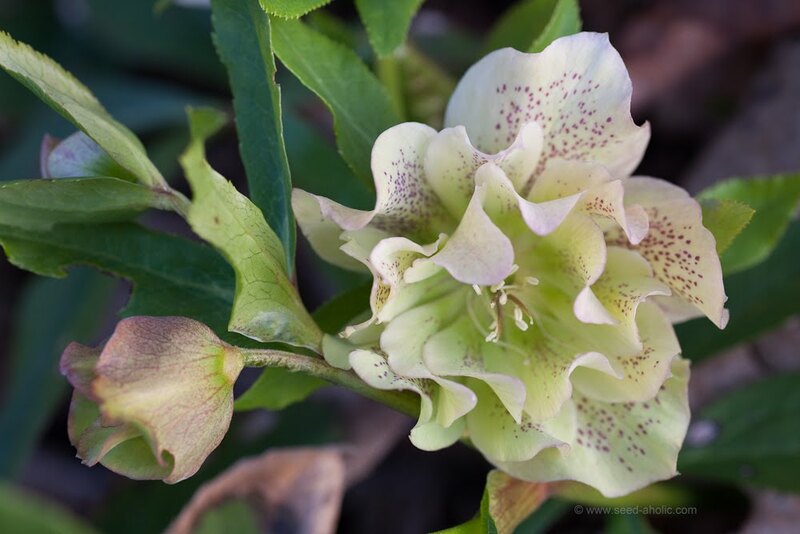 One of the early saxes, is a fine peachy color. 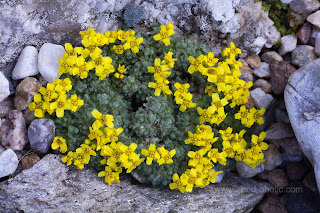 S. 'Joyce Carruthers' is named for that intercontinental plantswoman of rock garden crevice fame. Karel Lang hybridized S. kotschyi x S. x megaseaeflora ‘Krakatit’ in 2006 to produce this outstanding cultivar. 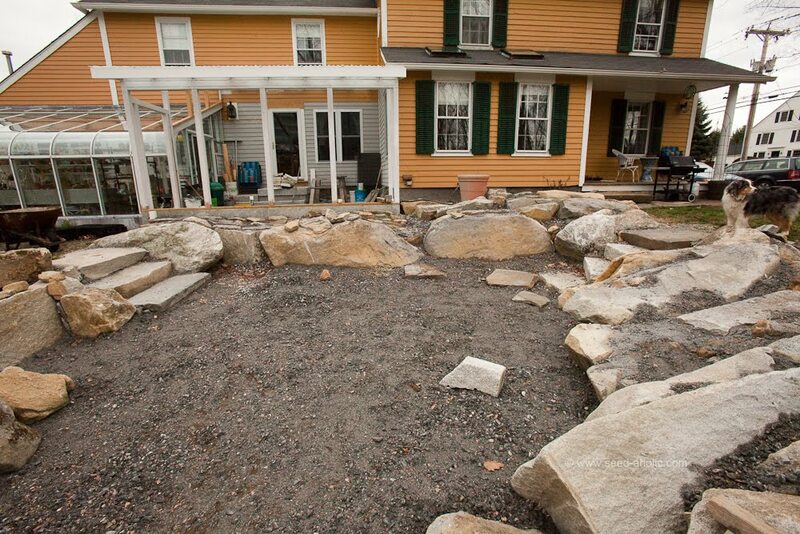 It has settled itself into the granite scree here in Goshen. 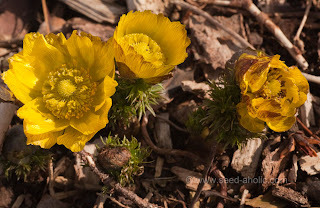 Adonis vernalis, which had already popped through the mulch that first morning, opened by afternoon with a smile. Another good do'er, it is blooming still after three weeks. 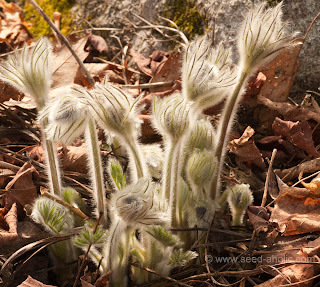 Another popper on that first day is the common Pulsatilla vulgaris. Yes there are other more aristocratic of the genus. But these feathery heads invite touch. And no one is squeamish if a bud is "overloved". The purple flowers are welcome, but have not the same showstopper appeal as buds or the seed heads. Drabas began their cycle that first day. The first, the woolly Draba polythricha, resides in the large soapstone trough near the driveway. It has a temperature mitigating stone wall at its back, blocking weather from the eastern front. Perfect conditions for this scree lover include lime crevices and sun. The first day it was possible to work in the garden, turned out to be shirt sleeve and shorts weather. 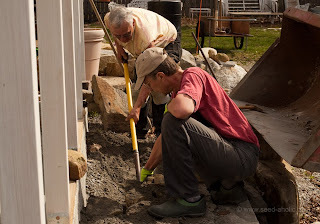 Rod and Ed took up planting the rest of the rocks in the new crevice bed. To get some perspective, on this same date a few years previous, everyone working outside was freezing even with coats and sweaters! We are using crushed stone called "Process" to pack the cavities. It ranges in size from thumb size chunks to fine sand like stone. What works best for the plants is a two inch planting area between stones. There is nothing quite as wonderful as a fresh canvas to plant. This new bed was constructed to plant western US jewels. I have long wanted an area for my hardy cactus as well as lewisias, genistas and acantholimons. I am certainly not averse to mixing areas and will throw in Turkish and African genera to try out hardiness. Of course, last winter was one or two zones warmer than usual. We must wait and see what the volcano will do for our increasing warmth. But drainage remains at the heart of keeping plants happy...alpines that is. 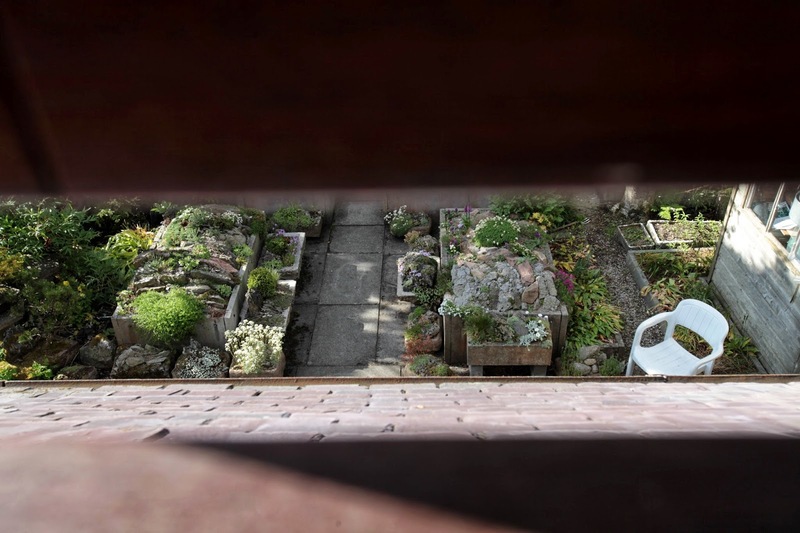 This new garden has many nooks and crannies. I look forward to another easy maintenance affair. This spring it only took me two evenings to get my sand beds and granite sax beds in order. 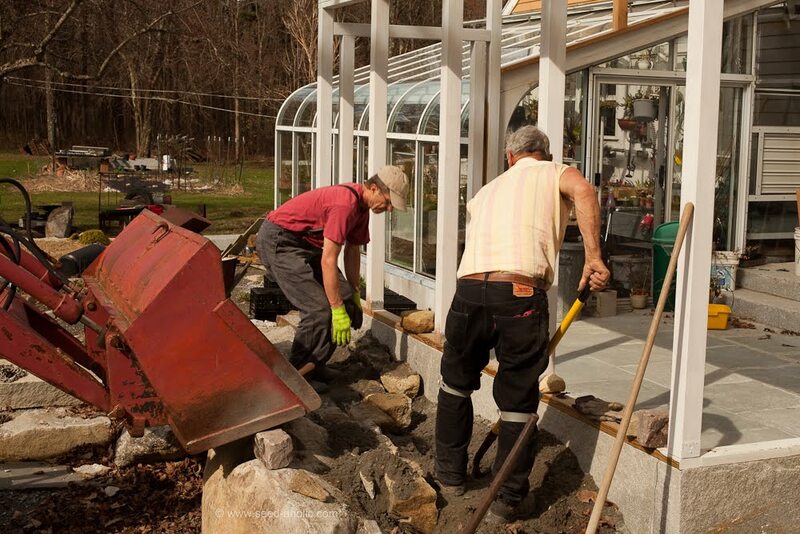 I spent the rest of the week on one of the perennial gardens. Oh, why did I ever plant phlox! Every root hair sprouts yet another plant. 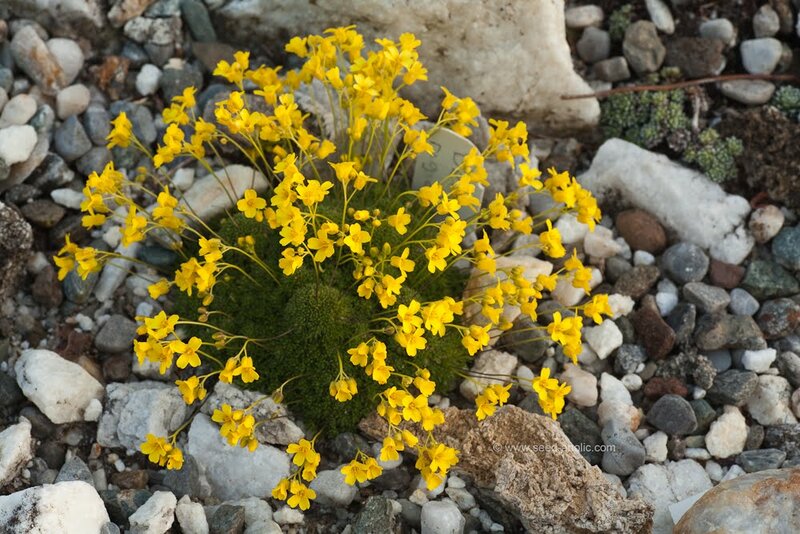 Not so with this little gem of a draba. It stays compact, yet is floriferous at precisely the time in the garden I want to be there- April. 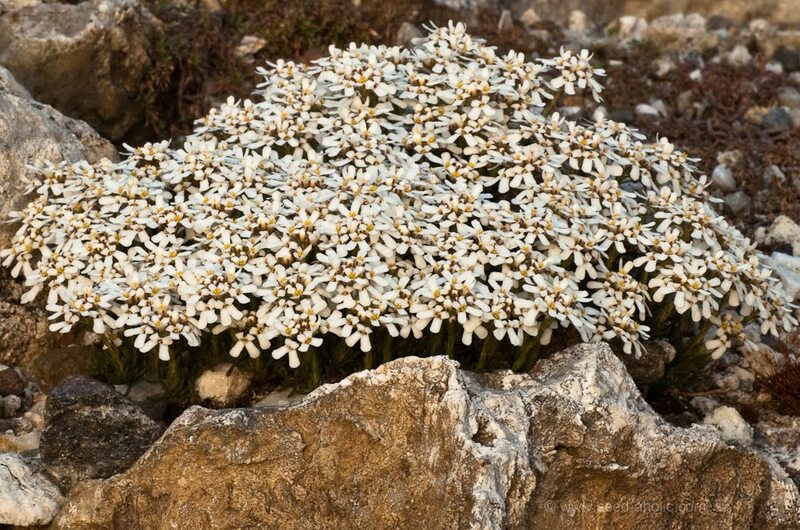 Another of my favorite friends is the tiny sub shrub Iberis. 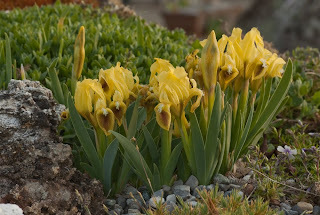 It has required no attention for the ten years it has resided atop the raised lime bed. 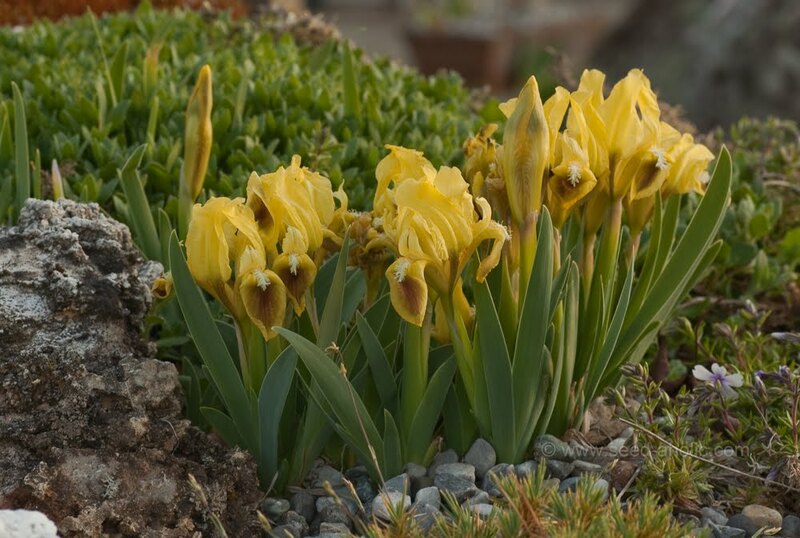 There are many early iris, but the yellow form of I. pumila is old reliable, flowering for several weeks. The purple form is budded, but not open yet. 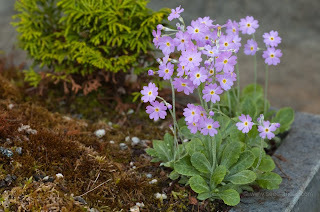 And don't forget the primulas. Yes, many of the brazen allionii types are out now but P. farinosa always steals my heart. 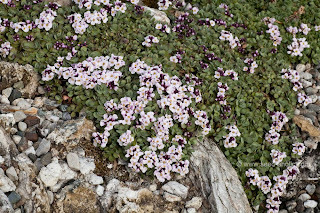 Quite happy in its own niche in a soapstone trough, it has self sown over the years into a small horde. While hellebores have been open since February, this double always waits until April. At any time it is welcome. Cheers! Great pictures! 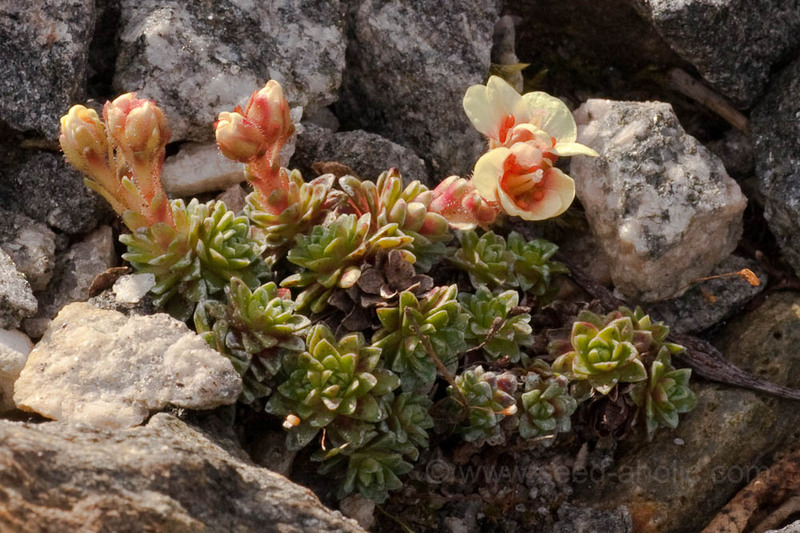 I envy your vast mat of A. oppositifolia: wow! You're several weeks ahead of us: many of the plants you had blooming in April are now blooming in Denver...snow falling as I speak.